Life, here, held very few pleasures for Arthur Baynes. His clay pipe — the smell and taste of which still offered the faintest reminders of home — was quickly becoming as one with the wretched clay soil of this Somme Valley. The light-headed exuberance that used to accompany alcohol had been contaminated by the experience of swigging rum in the terrifying moments before heading over the trench parapet. Even chasing women, when it happened, had become a joyless affair. There was no fizzing expectancy of passion. In the days away from the front, if the lads were lucky, they might find a cold, loveless experience with a local farmer’s wife or daughter. But those were clinical transactions, in emotion if not cleanliness. At thoughts like this the distant voice of Reverend Cole at St Mary’s on Bramall Lane, back home in Sheffield, would whisper admonitions of vice in Arthur’s head. But then, as Arthur had found out, Reverend Cole wasn’t always as sure about things as he thought. For example, he’d always said that hell lay at the bottom of a great fall. But, as Arthur knew, in this part of Northern France, hell could be found little more than eight feet down. After what Arthur had seen in the last few weeks, perhaps simply living, breathing, was enough. Perhaps hoping for even a momentary burst of happiness, a fleeting experience of stimulated senses, was too much to contemplate. Perhaps just being able to think about past comforts was a privilege. And in moments of reflection Arthur did think about many things: his mother and father; his little sister; but most of all he thought about his Raleigh number 29 road racing bicycle. Arthur was 23 years old, a teacher by profession, a cyclist by choice. Back at home he had been a member of the Sharrow Cycle Club. He’d been pretty quick, too, winning plenty of the club’s cups and medals. But competition was only part of his life awheel. What he enjoyed most was heading out on long rides over the Peaks, or going on weekend camping trips with his clubmates, taking in the glorious Yorkshire air. ‘God’s own country’, so it was called. Another entity could claim rights to the Somme. Arthur and a few of the other lads in the ‘Sharrow’ had seen Lord Kitchener’s posters go up around town, asking for volunteers to fight the Hun. It sounded like an adventure, a continuation of club companionship, and they were all eager to do their duty for King and country. So they trotted down to the Town Hall and signed their life over to His Majesty, joining other groups of men from places like the university, banks and local businesses. Together they became soldiers of the Sheffield City Battalion — the ‘Sheffield Pals’. After months spent learning the basics of soldiering at Redmires — a camp west of Sheffield that could almost match Arthur’s present environment for bleakness — and then further training around the country, they were sent off to Egypt to protect the Suez Canal. Soon they were moved on. By the start of April 1916 they were in the trenches of the Western Front, opposite the heavily-fortified town of Serre. Compared to their demanding but largely uneventful time in Egypt, life here was unsettling from the start. Private Alex McKenzie had been the first Sheffield lad killed, by a German rifle grenade, on the battalion’s very first morning at the front. Then, on the night of May 15, 60 of the Pals were killed or wounded when the Germans launched a trench raid and bombardment. Arthur had seen friends literally blown apart by the shells. Others he had helped to carry away, limbs missing, flesh torn, lives destroyed. If it wasn’t a raid or counter-raid, or hidden snipers waiting for pot-shots over the trench brow, or the almost unbearable thunder of artillery shells, there was the inescapable, cloying mud. There were the rats that scurried by their feet or over their bodies as they tried to sleep. The lice that inhabited every seam and crevice. The constant dampness that permeated their uniform. The constant fatigue that permeated their bodies. The constant fear that permeated their souls. Now, though, it was early June and the battalion had moved a few miles back from the front to a camp at Bus-les-Artois. There was some slight respite. The men knew a major push was being planned and the Sheffield Pals were training for it. But the immediate terror and filth of the trenches were for somebody else, for now. So, on a quiet day, when Arthur saw the Royal Engineer’s bicycle lying unused, he had to ask. Just a quick ride, that was all he wanted. And in a moment of generosity it was granted. It might have been a foreign bicycle, in a foreign land, and Arthur himself was a different person to the naive young man who had left Sheffield a year ago, but the joy of pedalling surged through him just the same. His sensibilities, which had been blunted by shock and hardship, re-awoke instantly as he headed towards Courcelles-au-Bois and then Colincamps on the damply glistening prepared road. Of course the bike was a bit heavier and less sprightly than his Raleigh, but it rolled, and it pedalled, and right now that was all he needed. How far could he ride? He didn’t care, spinning along with the gentle waves of shallow hillocks, twisting and turning through their troughs. So different this flowing, albeit now charred and pockmarked landscape, to the challenging slopes of his native Peak district. Occasionally Arthur was forced onto a field track, letting the machinery of war pass by. Even more occasionally he would try to cross a field, causing the thick Somme gloop to stick to the bicycle’s tyres, frame, mudguards, anywhere it could reach. He headed down to Auchonvilliers — or ‘Ocean Villas’, as the men of the British Expeditionary Force had taken to calling it — and glanced eastwards, towards the front line. As Arthur looked out across the small valleys, a blanket of mist lay over the brown land: nature’s way of hiding man’s inhumanity. But Arthur knew what lay beneath the covering. The incessant pitter-patter of falling drizzle might as well have been the soft sound of young bodies hitting the sodden earth. In the areas of landscape that could be viewed, craters had obscured the squared pattern of fields, like cigarette holes burned into an unloved patchwork blanket. His thoughts turned back to Sheffield, where the ‘Sharrow’ was also pedalling on despite its depleted numbers. The older club members who remained sent out warm clothes and food, not to mention the club newsletter to the lads at the front. While the practical provisions helped to raise spirits, Arthur’s eyes lit up most when he turned to the results page and saw his club records still standing. “You can take the cyclist out of the competition, but you can’t take the competition out of the cyclist,” his mates would laugh every time they saw Arthur’s smug smile. But with so many of the youngest and fittest club riders now sharing the French mud alongside him, his records were safe. Safe for a generation, in fact. Up and onto a fertile plain he cycled, leaving behind some of the sights and smells of war. Agricultural elements took their place. The aroma of cows, normally something to turn the nose, wafted over him fresh and wholesome compared to the fetid stench of the trenches. Although the flat fields to either side were bruised and scarred, young shoots of maize grew strong and upright, resisting the wind and rain. They’d be cut down before summer was out. The open road, the open countryside, and the effects of cycling proved intoxicating. In these circumstances the heavy, dank haze, which so affected morale otherwise, seemed invigorating. How unlike the enclosed sensation of wearing a gas mask, he thought. Arthur descended and passed through the village of Mesnil-Martinsart, with its battle-weary church and village hall, and stone barns with arched gateways. Somewhere nearby the crowing of cockerels took the place of artillery explosions. On a valley floor he rode between two thin rows of trees with an alternating arrangement of green and terracotta-coloured fields lying just beyond them. He thought about his own cycling at home, when he’d been racing, when he’d had to sacrifice dignity and composure to win or ride quicker. 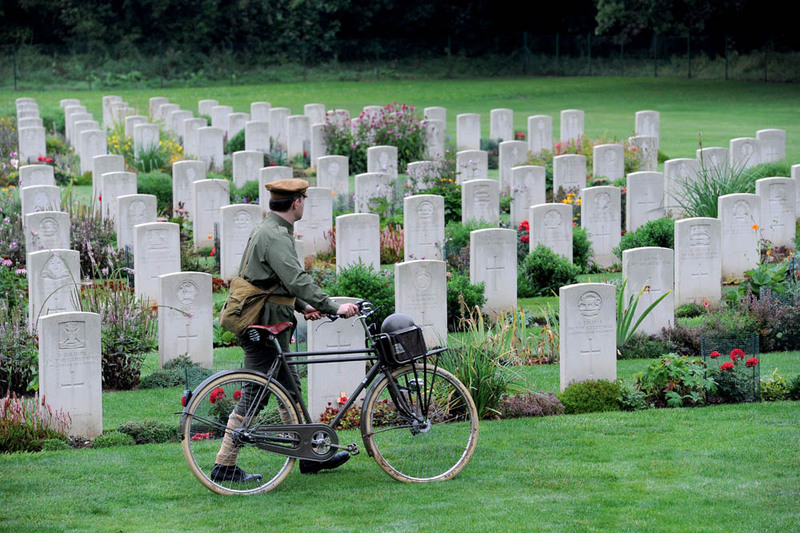 Here, at war, dignity and composure was a daily personal battle, yet those experiences on a bicycle were of little value. At home he could have stopped at any time, or soft-pedalled until he recovered. There was no soft option available at the front. At home his bicycle was freedom. There was no true freedom here. The terrain grew slightly tougher. Copses appeared on the surrounding slopes, and bigger climbs tested his stamina. Having seen fatigue as a precursor to death in the trenches, it was odd to rediscover that fatigue on a bicycle felt strangely life-affirming. 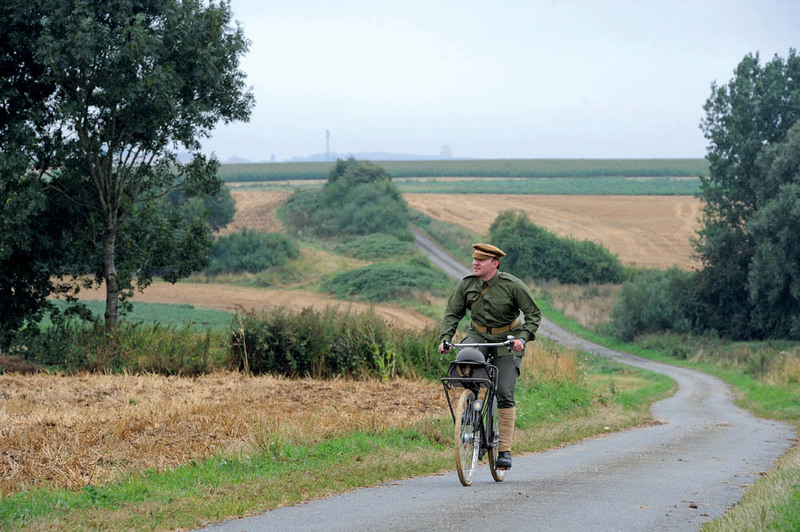 On a bicycle he felt more than just another body trying to delay being consumed by the Somme’s rich soil — he felt able to challenge it, control it, master it. The road, such as it was, snaked its way to the outskirts of Aveluy and he was soon cycling along a boulevard of saplings, alongside the Ancre river, towards the town of Albert. After the relatively insignificant pockets of civilisation he had passed through so far, Albert was altogether different. The buildings were continuous, not interspersed, and made of strong brick. Shutters guarded the windows. A few houses even retained their Juliet balconies. But not even a town with these qualities could avoid the ravages of war. Half the strong bricks had been turned to rubble. Most of the shutters stood drunk on duty. And romance had long since made way for survival. and dark clouds were merging ominously. The atmosphere felt expectant. A storm was brewing. Arthur smiled to himself, aware his brief ride from reality would soon be over. He knew he would have to return to Bus Wood, and the bicycle would have to be returned to its owner. But for now he wanted to pretend this was a typical Sunday ride, a spin like any other through a benign countryside. He realised that for a couple of precious hours he had forgotten about war. It was just him, the bicycle, and the road. Despite being fictional, our story is based on real places, events and people, including Arthur Baynes. 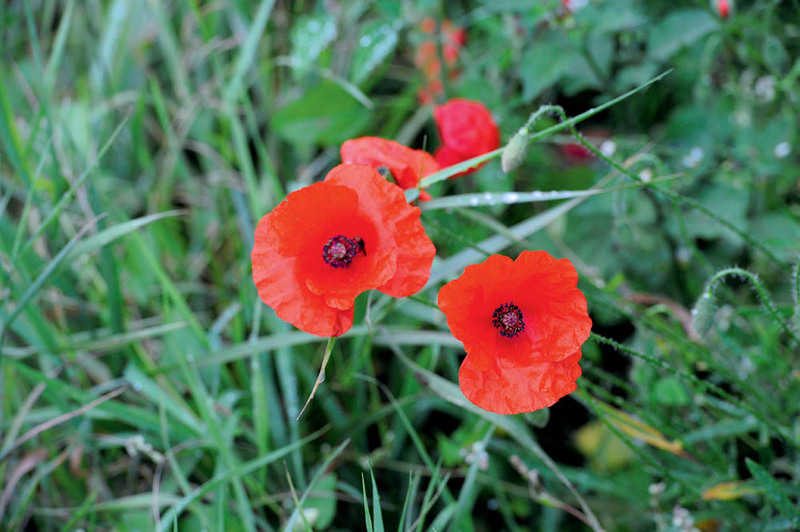 At 7.30am on July 1 1916 — the beginning of the Battle of the Somme — Arthur’s friends in the Sheffield City Battalion rose up from positions in No Man’s Land and began to walk towards German lines on the outskirts of the village of Serre. Although British artillery had supposedly weakened the enemy, the response was ferocious. The first and second waves of Sheffield Pals were brought down in a hail of machine gun fire; the third and fourth waves were cut in half before they even reached No Man’s Land. Of the 783 Sheffield City men who went over the top, 248 were killed, 265 seriously wounded, and 75 slightly injured but still on duty. The Sheffield City Battalion continued on until disbandment in early 1918, but in little more then 10 minutes its ‘Pals’ spirit had been lost forever. Between 1914 and 1918, almost 10 million soldiers, sailors and airmen lost their lives in the Great War. The British Army had volunteer cyclist units among its numbers since the 1880s, and when war broke out in 1914 there were 15 Territorial cyclist battalions. These were used for coastal defence work in the UK until 1915 when the Army Cyclist Corps was founded. 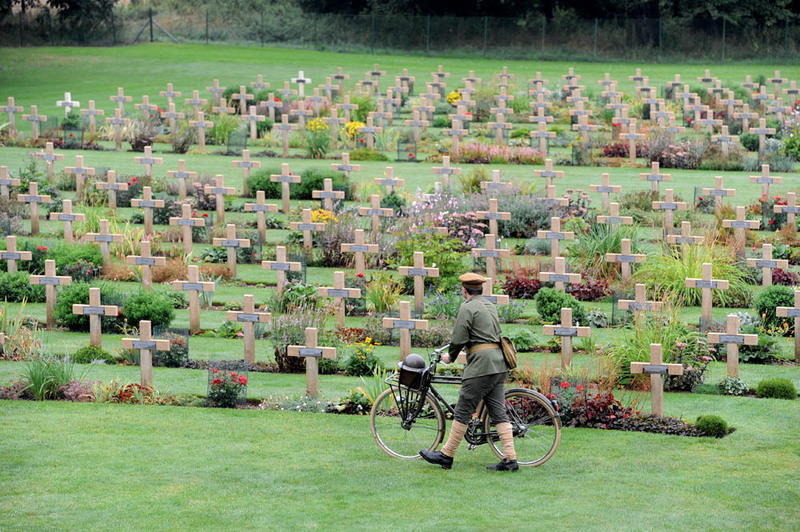 The first cyclist units to go overseas went to France, Flanders and Gallipoli. In the early days of the war, military cyclists were employed as scouts, although in Belgium, British and German cycling units actually engaged each other in combat. However, when the war became bogged down in trench warfare, the effectiveness of cycle-mounted soldiers was hugely compromised and some members of the Army Cycle Corps were converted back into infantry units. Meanwhile, individual divisions often had their own cycle companies, which were used to reinforce divisional cavalry squadrons, serve as military police and provide working parties to assist divisional engineers. Other cycling troops tended to take on three main roles: messenger work, scouting and security patrols, especially along canal systems which were vulnerable to sabotage. Because of the difficulty using bicycles in combat the British Army decided there was no long-term role for cyclists and the Army Cyclist Corps was disbanded in 1919. The National Cyclists’ Memorial, commemorating those riders who gave their lives in World War One can be found at Meriden, West Midlands. One of the most astounding and appalling things for any visitor to the Somme battlefields is the frequency with which you encounter roadside military cemeteries. The scale of death here is almost incomprehensible, and body parts are still being recovered to this day. However, the Commonwealth War Graves Commission does a magnificent job keeping these countless memorials in perfect condition. Also being recovered to this day are munitions, as farmers plough land that had once been a warzone. We found these shells at the side of the road near the Sheffield Memorial Park, and British visitors we spoke to at Thiepval had found bullets and grenades there in recent years. If you visit, remember: it might be 100 years old but this was live ordnance and it is very dangerous. Please don’t pick anything up. As well as being historically fascinating and emotionally stirring, this area of northern France heading into Belgium is excellent cycling territory. 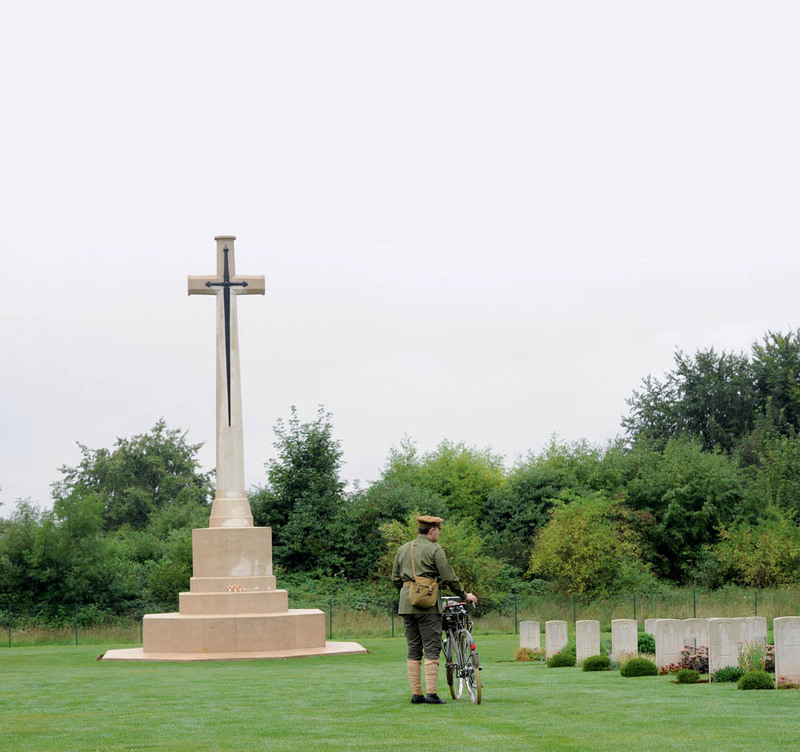 For Arthur’s ride we have focused on only a small section of the area surrounding where the fiercest fighting of the Battle of the Somme took place, but there are many ways to enjoy a much longer cycle tour. If you head south along the coast from Calais you could cycle down the Somme Valley, right from where it meets the Channel at Saint-Valery-sur-Somme. There are some great on and off-road cycle routes nearby, and the canal path from St Valery to Abbeville is beautifully flat. From Abbeville keep following the Somme towards Amiens and all the way to Péronne. At Péronne you’ll find the Historial de la Grande Guerre museum: a leading centre for World War One study with more than 80,000 visitors a year. 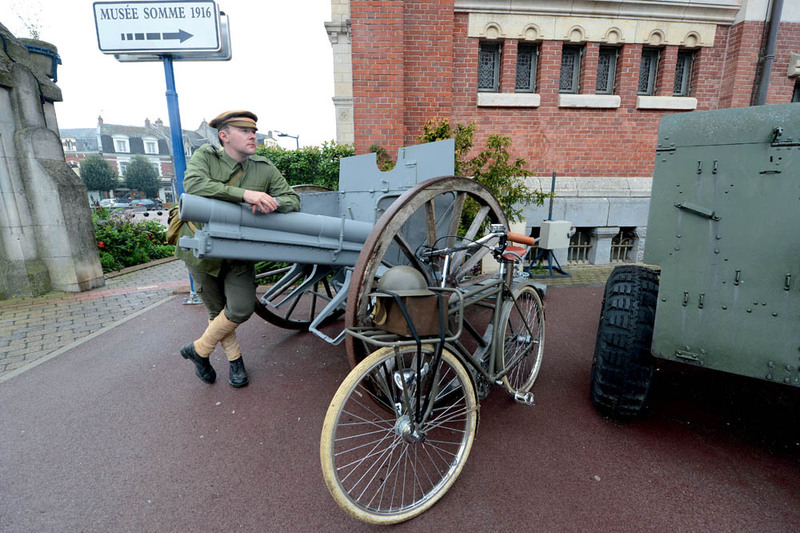 Presentations are made in three languages — French, English and German — while the museum’s displays and films show what life was like for soldiers both in the trenches and behind the front line. The museum at Delville Wood — 10 miles north-west of Péronne — is one of the most impressive memorials in the area, and is dedicated to the memory of 25,000 South Africans who died in the two World Wars and Korea. The museum is built around a centrepiece of the Cross of Consecration and was designed to be a replica of a star-shaped stone fort in Cape Town, called the Castle of Good Hope. Continuing north from Longueval, beyond the town of Arras — which, incidentally, is a perfect base for anybody wishing to explore the Somme — you’ll find the Canadian Memorial at Vimy Ridge. It’s possibly even more striking than the incredible monument at Thiepval, standing as two gigantic menhirs upon the hilltop. 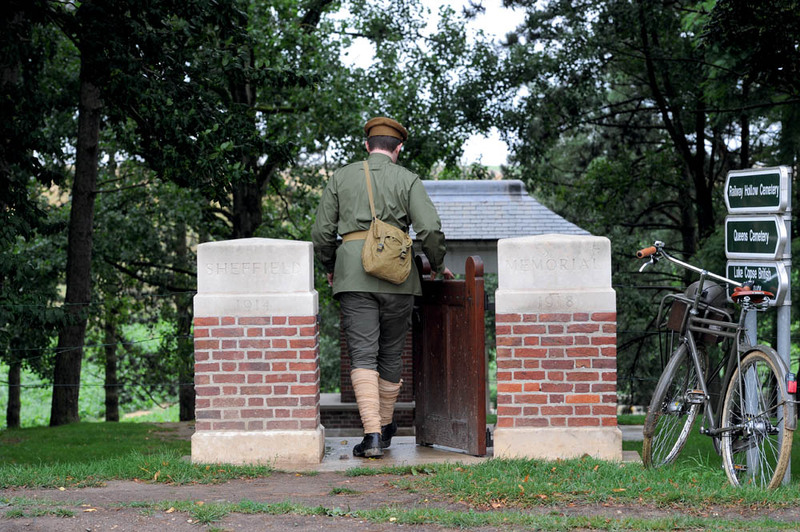 The 250-acre preserved battlefield park in which it’s found is a tribute to the 60,661 Canadian Expeditionary Force members who died in World War One. Away from war, head east from Vimy, past Lens and Carvin, to Mons-en-Pévèle where you could pick up the route of the Paris-Roubaix Classic cycle race. From Mons it’s possible to follow the event’s final 30 miles, including its last 10 sectors of historic cobbles. 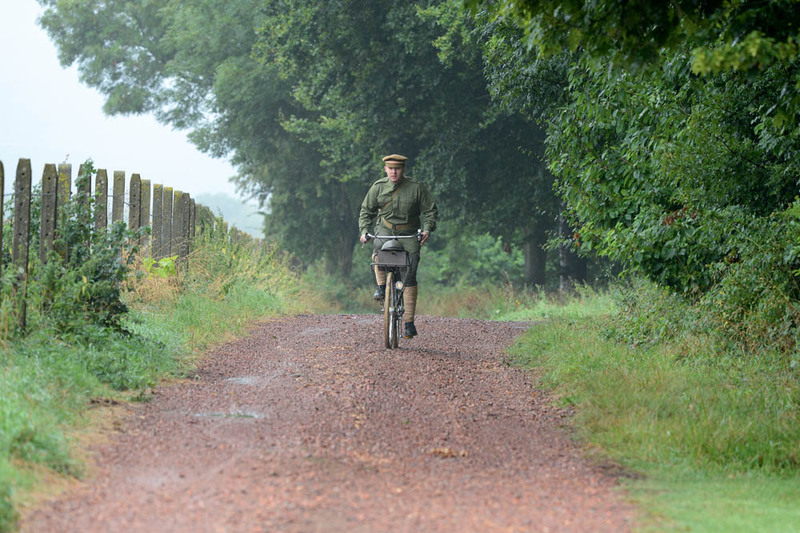 While bike racing is a world away from the horrors of war, the cobbled course will take you back in time to experience what road conditions were like 100 years ago. Finally, 20 miles north-east from Roubaix, over the border into Belgium, lies another site of ferocious fighting during World War One: Ypres. In the town centre stands the impressive Menin Gate, commemorating soldiers of the British Commonwealth who fell in the area and who have no known grave. 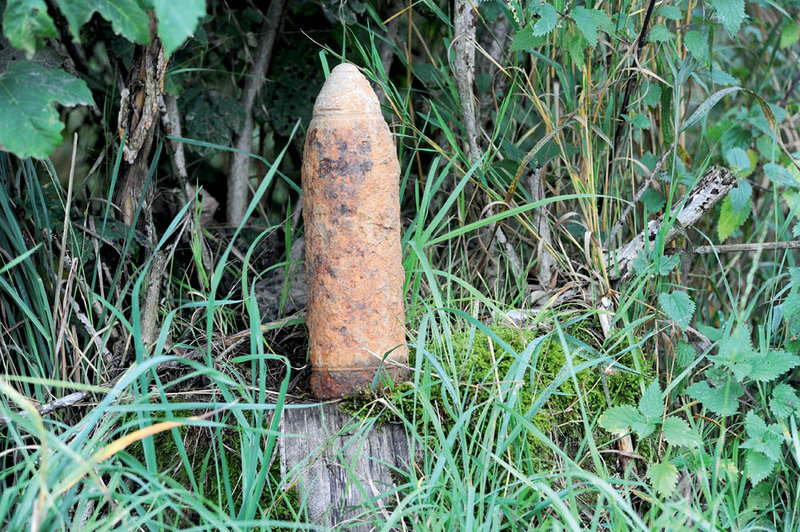 As with the Somme, the area around Ypres has no shortage of other things to see.